Can New York Help You Hit Your Media Studies Objectives? Caroline Reid, lecturer at Exeter College, writes about her experiences of exploring New York in order to broaden her media studies students understanding of the industry. The media-focused New York trip is something our students talk about long after we arrived back in the UK. It creates a positive ‘buzz’ for the College as well as generating excitement and expectation for future outings. We can almost always guarantee that our annual New York media trip is sold out before we even release the dates! This year, our media and film students were spoiled with subject-specialist highlights packed in to each day of the four night, five day educational tour which Travelbound were happy to accommodate. Our students toured NBC Studios where they learned about sets, live editing and even got involved in a studio filming experience, as well as being lucky enough to get standby tickets for a rehearsal with NBC star, Seth Meyers! Every year we opt to visit The Museum of the Moving Image in Queens where our film students can interact with sound studios, animation stations and see costumes and props from their favourite movies. The museum also has special exhibitions, with highlights this year from director Martin Scorsese and an exhibition from Jim Henson, creator of The Muppets, scheduled to follow. 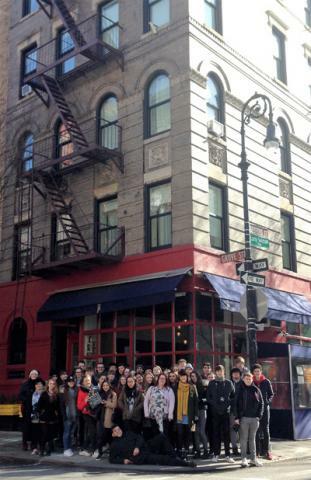 Our students were also impressed with their Film and TV coach tour, where they learned how New York City plays such an important role in so many of their favourite shows, including a stop-off at the famous ‘Friend’s’ apartment building. Travelbound also helped us to organise extra excursions, including an evening performance to award-winning Broadway hit show, Aladdin. With incredible set designs and changes, our stage management students were in awe and everybody was singing along. But one of the key highlights for the trip this year, was our students being in the audience for a live recording of Good Morning America: a popular, daily US breakfast show, broadcast from Times Square five days a week. We were given the opportunity to really experience what it was like to be a part of a live studio broadcast and this was especially enriching for our film and TV students, many of whom had been working on their own studio projects back in the UK. Aside from a very early start (5.30am! ), our media students loved the experience and learned how an audience is warmed-up before broadcasting and how involved they actually are in the show. 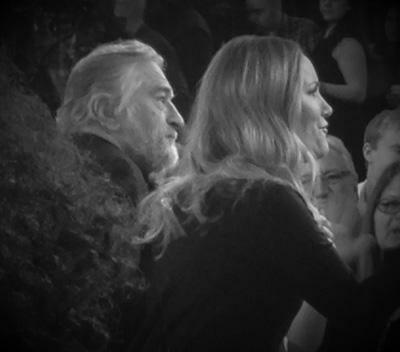 They were also able to witness all of the quick set changes between segments and saw guests, which included the legendary Robert De Niro and the very funny Leslie Mann, promoting their new film. This made for some excellent photo opportunities. For anyone looking to organise a media-focused trip to New York, this is certainly the right trip for you. With centrally located hotels, excellent excursions and constant communication with your trip advisor at Travelbound, I guarantee an enriching experience of a lifetime for everyone involved. Should you plan a college trip to NYC? There are many factors to consider when planning for an educational trip to a different country. Staffing, risk assessments and costs are all things to consider, not to mention selling the trip to the students themselves. You also need to be incredibly organised, as juggling full-time work as a teacher and organising such a large trip can be very challenging. It’s best to ensure you have plenty of support from other team members who are involved in the running of the tour. My top tip for running a subject-specialist trip abroad is to make certain you have selected a travel company who you can trust and rely on. This is why each year (and for the past six plus years) Exeter College has chosen Travelbound University & Colleges.